By the time the screen fades to black and the words “Director, Vincent Ward” appear, you may not be quite sure what you’ve just witnessed, but you’ll know it’s something special and unique. 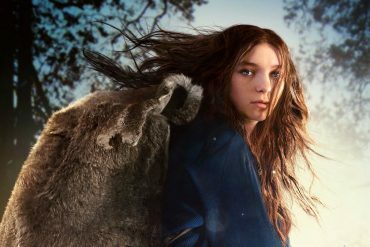 Vigil is a ‘rites of passage’ movie about a young farm girl growing up on in New Zealand, who has to deal with sudden tragedy, change, and her own sexual awakening. It’s impossible to sum up the story with a synopsis that doesn’t paint a bleak picture, but although it’s pretty harsh in places the film as a whole is strangely uplifting. 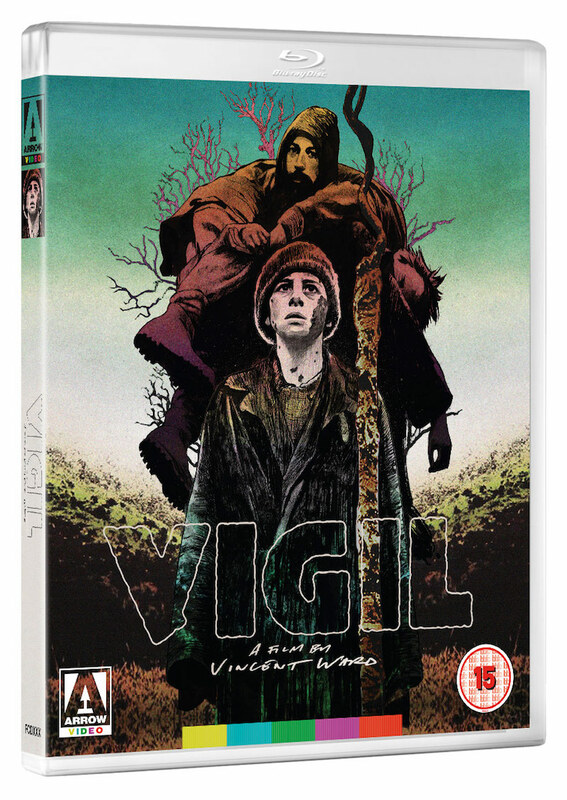 But it’s true the first 10-minutes of Vigil puts the viewer through the emotional wringer. 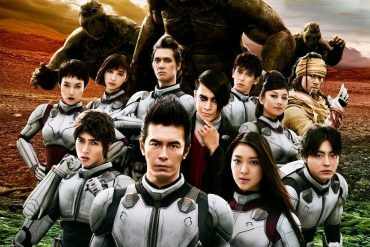 In the opening, we’re introduced to all of the small cast of characters, and it’s a credit to the performances that we’re emotionally invested in them almost instantly. 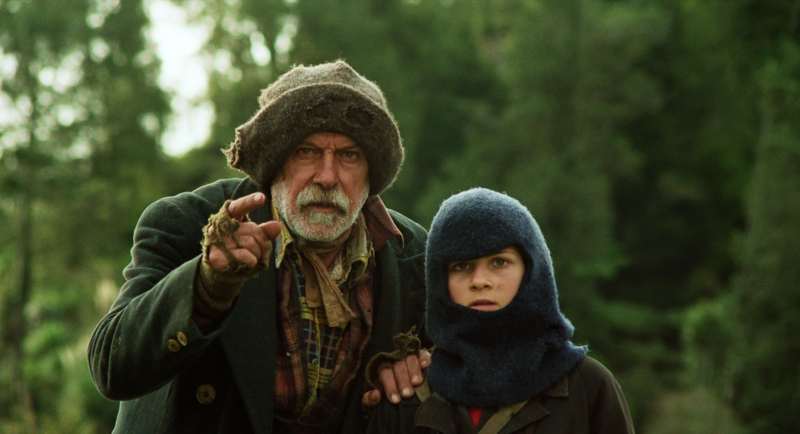 When ‘Toss’ (Fiona Kay) is momentarily separated from her father (Gordon Shields) and gets lost in the fog, she calls out “dad?”… and I don’t recall any monosyllabic line ever being so heartrending. And the real tragedy is yet to strike! 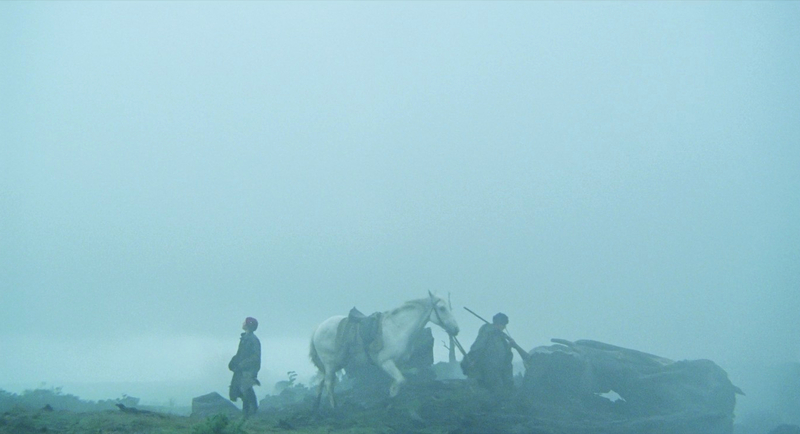 The early scenes in the fog have a cold austere beauty about them, with much of the screen a blank void. Figures emerge from the paleness like ghosts in a dream. We lose all sense of depth and scale and strain to make sense of what we’re seeing as the elements come together into lovely compositions of figures against a sublime landscape. This is a guide to how to make sense of the film’s narrative, which, though linear, doesn’t adhere to a strict progression of events. 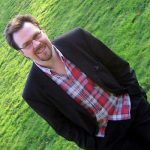 Whenever Vincent Ward has spoken of his writing process, he explains that he works on a story like a painter approaches the canvas: first blocking-in the big shapes, colours, the light and shade with broad brushstrokes, before adding finer details. He came out of an art school background and had trained as a painter. Apparently, Vigil grew from a few images Ward found in his imagination and had been “bothering” him for some time. He imagined a sequence of two rugged men, mounted on white horses, ‘jousting’ in the night with shovels. Ward wondered what the image meant and where it came from. He decided that it belonged in the mind of a disturbed child who’s dealing with some sort of traumatic experience. The story of a young girl who loses her father at the same time she reaches puberty developed from this initial idea. 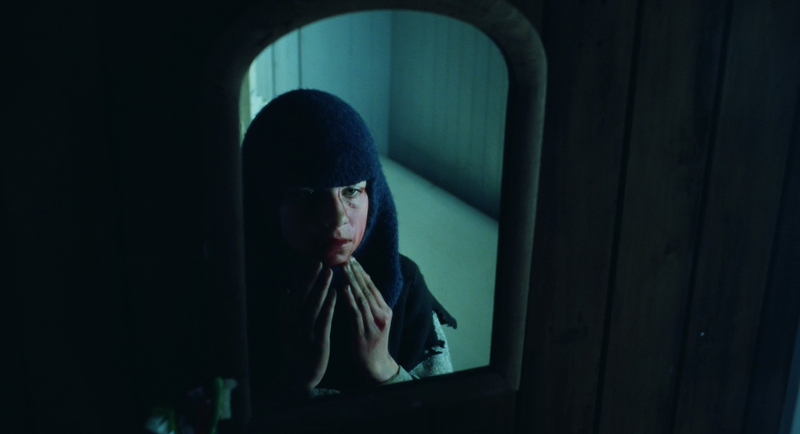 The scene survives as a dream-sequence within the finished film. When her father falls during a heroic attempt to rescue a sheep from a ravine, his body’s carried back to the farm by a poacher that Toss had glimpsed in the moments just before the accident. This sinister stranger, Ethan (Frank Whitten), immediately inveigles himself into her life, first as an additional farm-hand, to do the heavy work her father would have done, then as a rival father figure when he and her mother (Penelope Stewart) begin a tumultuous relationship. Penelope Stewart plays a difficult role with panache and manages to remain sympathetic even when clearly troubled by inner conflict. She honed her skills with a long run as Kathleen Leach in TV’s Prisoner Cell Block H (1979-80). Surprisingly this was Whitten’s debut, yet he plays Ethan with the brooding confidence and quiet power of a screen veteran, and it set him up for a prolific career as a character actor, mainly on Australian television. Fiona Kay is superb as the young Toss, delivering one of the greatest child performances I’ve seen! The dialogue in Vigil is minimalist, so she relies on the subtlest of facial expressions to speak volumes. Her performance relies on showing rather than telling, and she does this with admirable restraint. Apparently, Ward auditioned around 200 young actresses before settling on Kay, who’s clearly perfect. 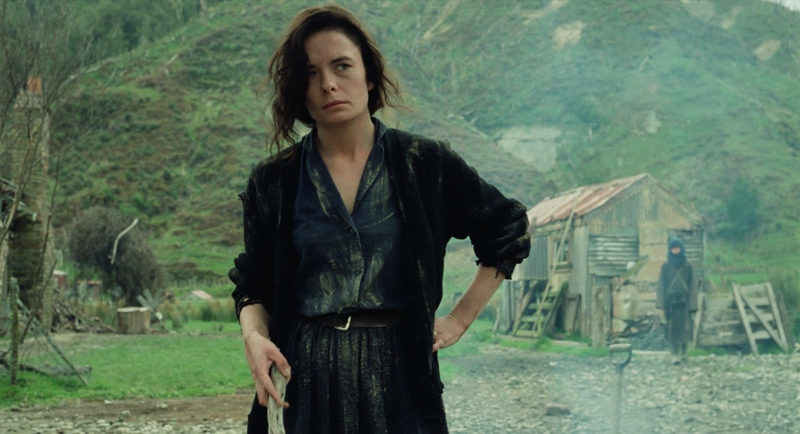 She should have gone on to a great career, but after Vigil she only appeared in three other roles: an obscure short called Gravity’s Angel, then a small role that was the best thing about Jane Campion’s terrible biopic of Janet Frame, An Angel at my Table (1990), and in a sci-fi miniseries for NZTV called The Boy from Andromeda (1991). Toss is living an isolated life without any influence from television, radio, school, the outside world… So, with only a bible and the strange views of her grandfather (Bill Kerr) as guidance, she’s understandably confused and starts to devise her own pseudo-religious belief system to deal with her grief and to make sense of the strange urges she’s beginning to feel. She hates Ethan, associating him with the loss of her father, but also seems inexplicably fascinated by his earthy masculinity. 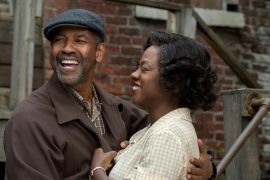 Their relationship, which becomes very uncomfortable at times and presents the film’s more controversial content, continually changes and develops and really gives the narrative its central thread. She erects the gnarled bough of a dead tree as some kind of monument, and pushes food into the mud at its base as an offering to her father’s spirit. She continually wears his balaclava and raincoat and builds a shrine in an old car wreck abandoned in the middle of a swamp. With all the mud, rain, swamps, and childhood mythologising, Ward must’ve been touching the zeitgeist, pre-figuring the rain-drenched biblical imagery of Nick Cave’s first few solo albums. That’s what Vigil most reminded me of—scenes from Nick Cave lyrics like Tupelo (1985) or The Carny (1986), “The rain came hammering down / The whole valley reeking of wet beast and rotten, sodden hay, Freak and brute creation.” If you like Nick Cave, you’ll love Vigil… and if don’t love Vigil, then you won’t understand Nick Cave! There’s little precedent for this kind of thing, except perhaps Equus (1977), which also features a confused adolescent who devises his very own form of pagan horse worship. But Peter Shaffer’s play, upon which the film of the same name was based, was deliberately aware of some grand intellectual themes, psychology, and classical reference. The symbolism of Vigil is very much its own. 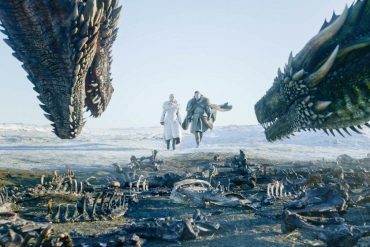 Ward has said he despises the kind of contrived symbolism rife in the art-house films of directors like Ingmar Bergman, stressing that the iconography of Vigil evolved from the mythos of the characters and not his own intellectualism. A year later, The Wasp Factory by Iain Banks was published, another fiercely original story about a child growing up on an isolated farm and creating his own intricate system of magic and symbol… and prominently featuring sheep! It’s a fantastic book, and if I had to name my favourite novel, it would be a contender. The Wasp Factory took the literary world by storm, after being rejected by many publishers, and it seems telling that it was eventually accepted after Vigil became a critically acclaimed international success. Toss’s grandfather, Birdie, has a madcap idea that the hills are hollow, and if he can punch a hole deep enough the flooded valley would drain into vast subterranean caverns, making the land viable once more. 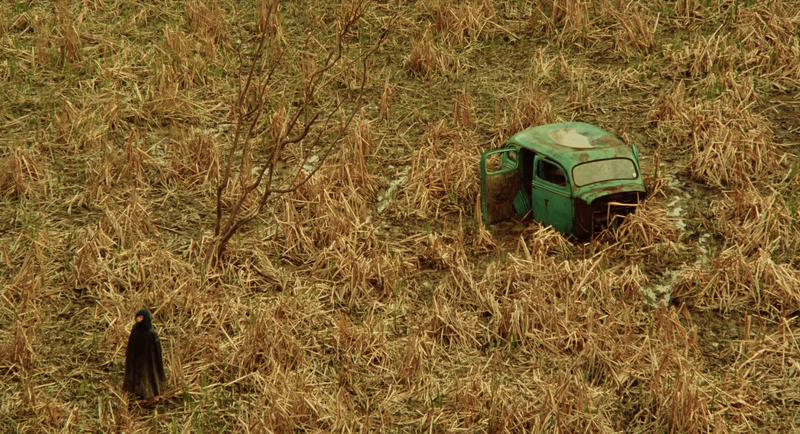 The scene when he and Ethan finally construct their tractor-powered contraption is a piece of absurdist theatre. Toss, incongruously dressed in her father’s heavy jacket and mother’s white tutu, is excited to see the thing in motion, its mast-like struts and dark sail hinging up into the clouds. Filmed on the ridge of a hill, outlined against the sky, the scene was conspicuously referenced in the video for Cloudbusting (1985). 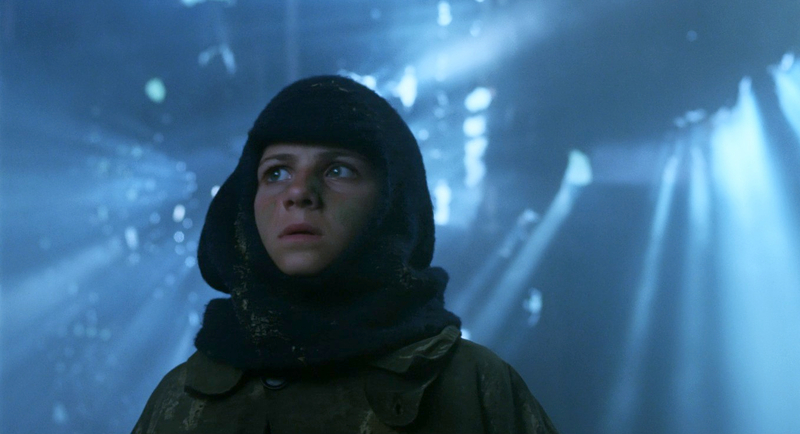 Kate Bush is playing the part of a boy rather than a tomboy, but has her hair cut the same as Toss and like Vigil, the song sees the adult world through the eyes of a child and is tackling similar themes of loss. 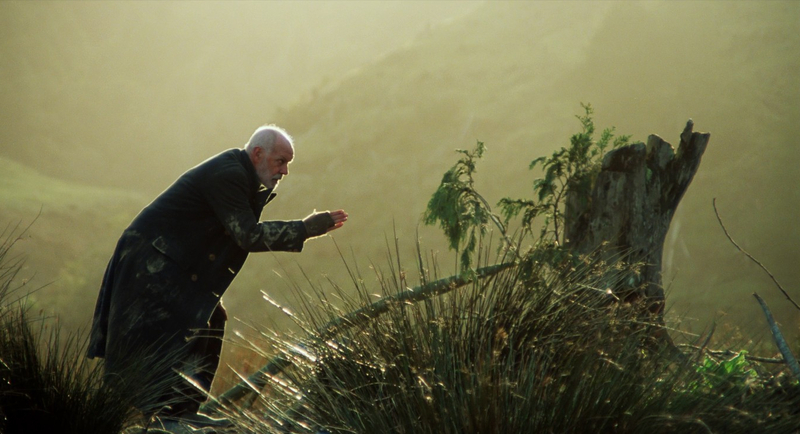 Vigil is beautifully photographed by Ward’s regular cameraman, Alun Bollinger, who often uses long lenses to place figures in a landscape that dwarfs them. The land itself becomes the dominant feature of many scenes. It looms, it moves… it seems to have a life of its own. 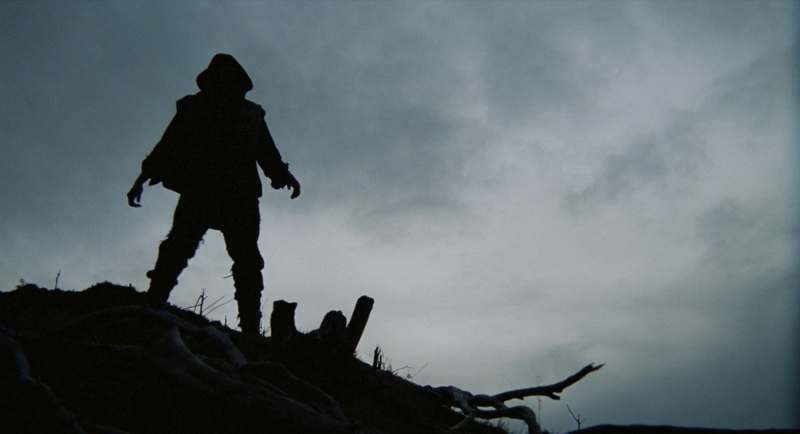 Vigil doesn’t sit comfortably in the horror genre, but I would argue it’s nonetheless a key piece of folk horror due to its unsettling treatment of landscape, the dark fabulist elements, and the naïve mythologies. I know folk horror is a genre usually associated with British film, but it also has deep roots in the Antipodean cinema of the 1970s. Peter Weir certainly gave us two genre-forming films with Picnic at Hanging Rock (1975) and The Last Wave (1977), both presenting us with mysterious forces and menacing landscapes. 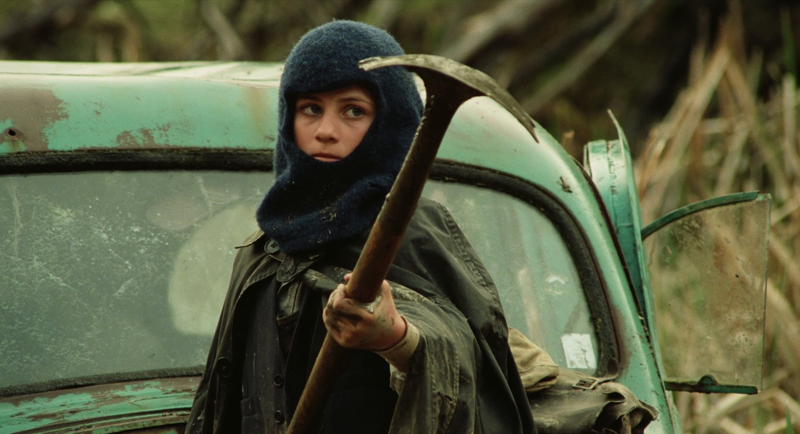 Perhaps the most chilling such Australian horror was Long Weekend (1978), directed by Colin Eggleston, which also uses the land as a sinister presence, though the threat is mainly embodied in the flesh of the creatures that inhabit it. Rarely seen in the UK, those who caught it on TV about 40 years ago can never forget that decaying dugong, inexplicably moving up the beach, watching its killer’s camp with a sinister stare of unwavering accusation. Although British, Sidney Lumet’s The Shout (1978) has a strong thematic connection in that the interloper, Crossley (Alan Bates) claims to have learnt the magical technique of the shout that kills from an Australian Aboriginal shaman. The location filming on the Devon downs and dunes certainly shares that sublime expansiveness and the land develops an unnerving presence. Vincent Ward’s first film was made around the same era. 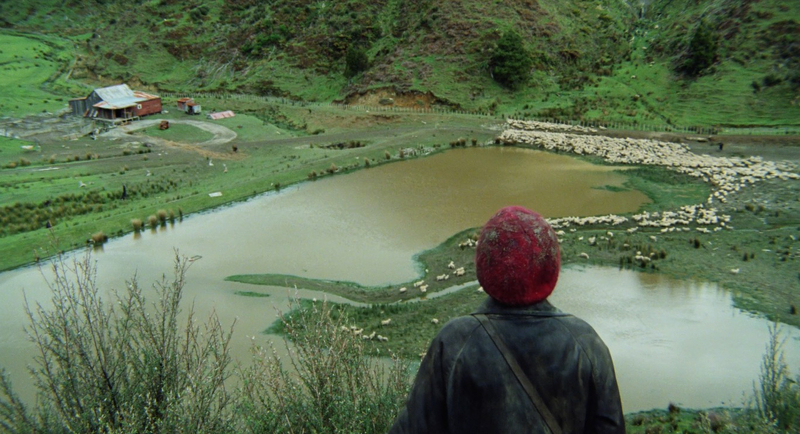 A State of Siege (1978) was a short based on a novel by Kiwi author Janet Frame, and also focused on an isolated character pitted against the landscape, extremes of weather, and her own internal landscape. He made it whilst a student at Ilam School of Fine Arts and it garnered enthusiastic reviews and won him a handful of awards international film festivals. When writing Vigil, Ward was living a sort of itinerant lifestyle with no fixed abode. He’d been living on an isolated farmstead for a 18 months where the elderly Puhi, in her 80s, singlehandedly worked the land and cared for her disabled and dependent adult son, Niki. The documentary he produced from this experience, In Spring One Plants Alone (1980), also won several awards and was compared favourably to the work of Werner Herzog. Drawing on this experience and his own childhood memories of growing up on a remote farm, he began writing Vigil. 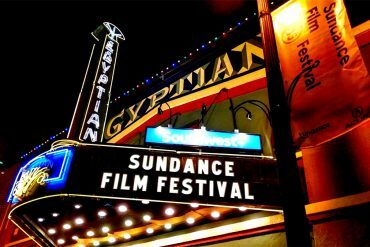 Vigil was his third production and debut feature and confirmed Ward as a distinctive and important filmmaker. 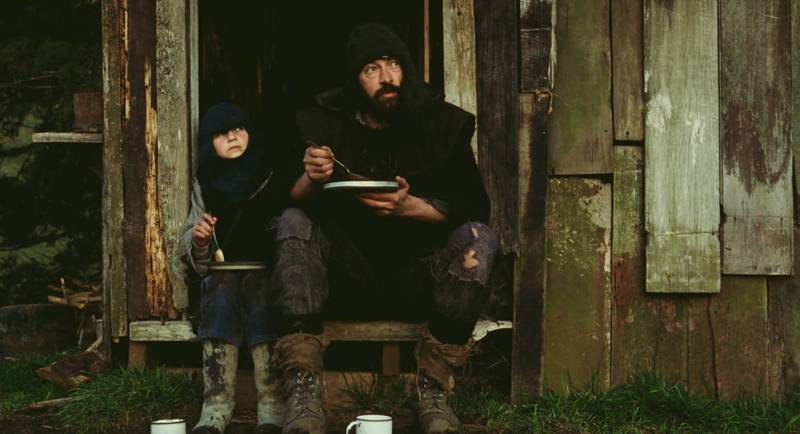 It was the first New Zealand film to get any kind of international recognition and was also the first of his country’s films to be selected for the Cannes Film Festival. For Ward, it concluded a thematically linked trilogy about women and how their inner lives meshed, or collided, with their surrounding environments. His next film was The Navigator: A Medieval Odyssey (1988), a strange time-slip romp that begins in plague-ridded medieval England and ends up in modern New Zealand. 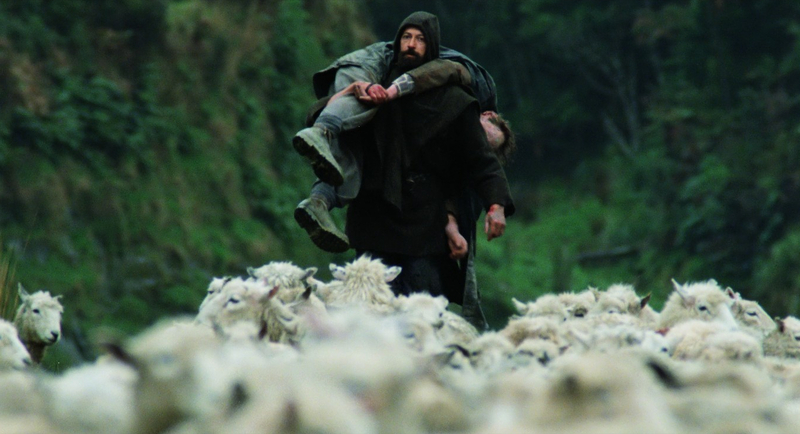 I think the seeds of its medieval-meets-contemporary imagery are clearly evident in Vigil… It was later re-worked by Jean-Marie Poiré as Les Visiteurs (1993) starring Jean Reno. The Alien producers wanted him to take it in a completely new direction and open up options for further stories in the Aliens universe. His story was set on, or rather in, a wooden planetoid that was some sort of massive medieval monastery where Ripley gets marooned, and then gives birth to an alien creature that she conceived with a mutant ‘boyfriend’. 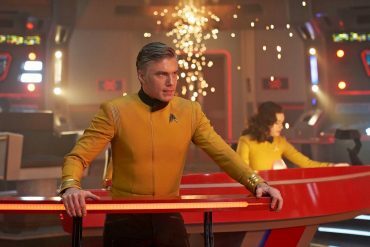 Eight months into development, it seems the studios got cold feet and he was dropped in favour of music video director David Fincher. Ward’s script for Alien³ was butchered, or at least had its tale docked [sic] by Fincher and friends. Instead of a monastery we got a prison colony, and all the horror of psycho-sexual biologic birth trauma evaporated. Ward has been adapting the detailed storyboards for his concept into a sort of graphic novel on his own website, so you can see for yourself how weird and wonderful it might have been. After making Map of the Human Heart (1992), a bitter-sweet wartime romance, Ward directed an adaptation of Richard Matheson’s romantic afterlife fantasy novel What Dreams May Come (1998), starring Robin Williams. 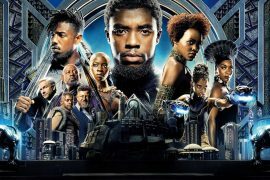 It was a tremendously ambitious experiment in merging motion painting and live-action together in an innovative way, that won him the Oscar for Best Visual Effects and the Art Directors Guild Award for Excellence in Production Design. 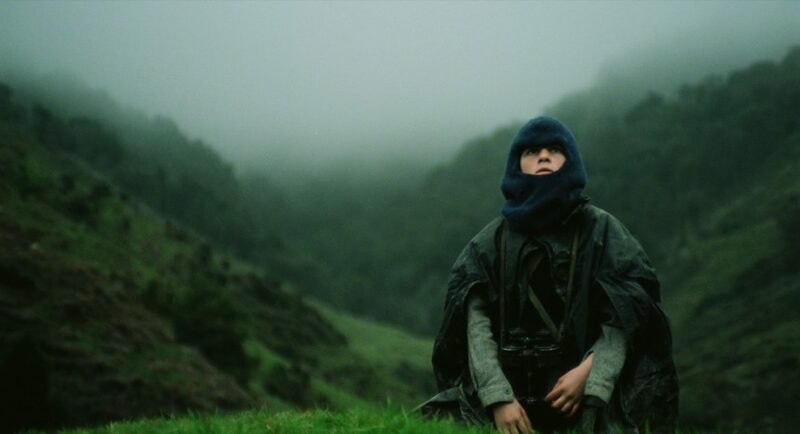 Since then, Ward has only made two more films: River Queen (2005), a historical drama set against the conflict between English colonists and the indigenous Maoris of New Zealand; and Rain of the Children (2008) a docudrama that’s a sort of ‘prequel’ to In Spring One Plants Alone and tells the life story of Puhi and her resilience through extremes of adversity. For me, it is Vigil that remains his most perfect piece of cinema. Original mono audio (uncompressed LPCM). The sound design is a really important element of Vigil; from the breathy silences where a heartbeat can be heard, to the cavernous echoes of the hollow hills, and the ferocity of the storm, and its all here to hear. The sparse, though exceptionally effective music by Jack Body (who also worked as a grip on the production) is also showcased to full effect. Brand-new appreciation by film critic Nick Roddick, recorded exclusively for this release. This 13-minute full-screen interview is really informative. Roddick, who was the first person not directly involved in production to see the film, when he was a film archivist for New Zealand, has become a personal friend of Vincent Ward over the years and is uniquely able to put the film into eloquent context. FIRST PRESSING ONLY: Illustrated collector’s booklet featuring new writing on the film by critic Carmen Gray. writers: Vincent Ward & Graeme Tetley. starring: Penelope Stewart, Frank Whitten, Bill Kerr, Fiona Kay & Gordon Shields.